the Bible’s use of that word. Based on this verse, it appears that the Bible endorses the drinking of wine and alcohol. Based on this verse, it appears that the Bible condemns the drinking of wine and alcohol. This often lends to people getting confused, they mistakenly believe that the Bible is contradicting itself, and so they begin to try to rationalize away anything that disagrees with what they decide they want to believe. However, when properly understood, the Bible is in perfect agreement with itself. on the subject you wish to know; then let every word have its proper influence; and if you can form your theory without a contradiction, you cannot be in error. Isaiah 28:7-29; Isaiah 35:8; Proverbs 29:27; Luke 24:27,44,45; Romans 16:26; James 5:19; and 2 Peter 1:19,20. If the subject of “Wine” is studied throughout the Bible, it becomes very clear that the Bible uses the word “Wine” to refer to two very different types of drink. Both of these substances are referred to in the Bible with simply the English word “Wine”. In Bible times, with no real refrigeration system like what we have today with modern refrigerators and freezers, juice that was squeezed from grapes, if not preserved through special processes, would normally have had to be drunk fairly soon afterwards, or it would gradually begin to spoil and ferment. That is why the fresh squeezed grape juice was called “Good Wine” or “New Wine” while the older, spoiled and fermented type was called “Old Wine”. 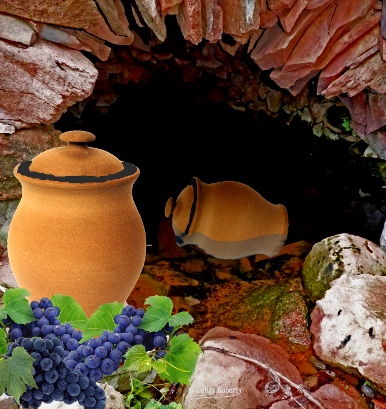 Because of this “lack of refrigeration” concept, some people mistakenly claim that the “wine” mentioned in the Bible would have had to be fermented, because the “ancients” would not have had any way to preserve fresh unfermented grape juice. This is an erroneous assumption. 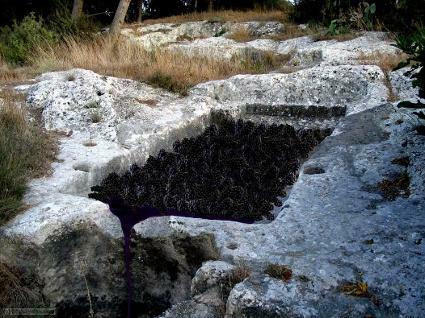 Archaeology has now proven that in reality, the “ancients” in Bible times, had much more knowledge than we now seem to realize on how to preserve grape juice in an unfermented state. Grape juice contains two leading ingredients, glucose (grape sugar) and albumen. The albumen is found in the lining of the skin of the grape and also in the envelope of the seed. Albumen favors the formation of microscopic organisms which are the fermenting agents. Ethyl Alcohol and Carbon Dioxide Gas. The ethyl alcohol is a colorless liquid that remains in the wine solution and the carbon dioxide gas forms tiny bubbles. It takes certain conditions for this process of fermentation to occur, such as moderate temperature, moisture, and air in the grape juice. The people of Bible times understood this and practiced four different methods of preservation that altered or eliminated those conditions so that they could preserve grape juice in an unfermented state. #1. 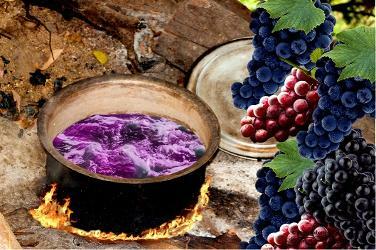 The first method of preservation was boiling the grape juice. 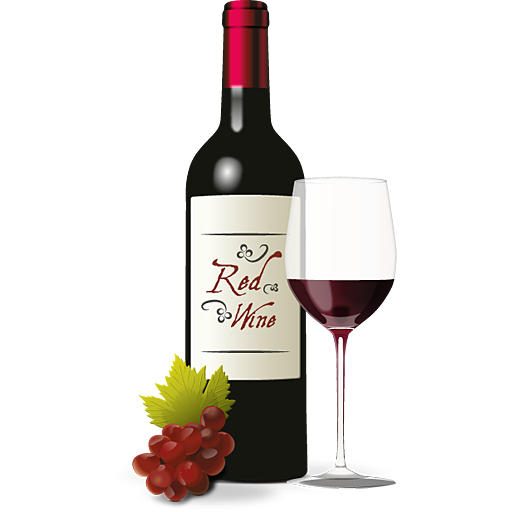 The fermentation process is completely destroyed when the moisture content of grape juice is boiled. Boiling evaporates the water, kills the yeast and molds, and increases the sugar content (which inhibits yeast growth). They would boil the grape juice down into a syrup which was called “Must” and as it boiled down, they would skim the froth off of the top to remove all the killed yeast and molds, then the remaining Must could be cooled and easily stored in an unfermented state for long periods of time. If they boiled the syrup down even more, it was called “defructum” or “sweet wine”. When they wanted to drink it, it could be consumed by itself as a syrup, or it could be diluted (thinned) with water and consumed. - it all depends on the context of its use! #2. The second method of preservation was by filtering. Since it is the albumen that contributes to the fermentation process, the “ancients” learned that they could filter, through careful procedures, the pulp from the juice and thus prevent fermentation. This product was also called a “sweet wine”. They filtered it by two different ways. The first of which was to collect the juice that flowed from the grapes when they were placed in the press - before the grapes were actually “pressed”. This was called “Gentle Pressing”. In other words, the juice that got squeezed out of the grapes by just the weight of the grapes on top of them. This juice was high in sugar content and did not have the albumen in it, (since the grapes had not be crushed yet,) and it could easily be stored in an airtight container without fermentation. The second way was to place the juice and pulp in a sacco (a bag) and set a container underneath it to catch the filtered/strained juice, which could then be stored in an airtight container. #3. The third method of preservation was through cold storage. Almost all fermentation processes cease at about 40°F (4°C). By lowering the temperature below 40°, the albumen settles to the bottom and the juice does not ferment. They would then place the grape juice in a container, seal it closed and make it waterproof with pitch, and then submerge it in a pool or cistern of cool water and let it remain undisturbed for six to eight weeks. After this process, the grape juice would remain unfermented. #4. The fourth method of preservation was through sulphur fumigation. Sulphur dioxide fumes prevent fermentation. They would burn sulphur in jars and then while the jars were full of sulphur fumes, they would fill the jar and quickly close it airtight, or sometimes they would fill the jar almost full, and then burn sulphur in the remaining gap at the top and while the fumes were still present, they would cap it closed. The sulphur displaces the oxygen and inhibits the growth of yeast. This would allow the jars to be stored for long periods of time, without the grape juice fermenting. 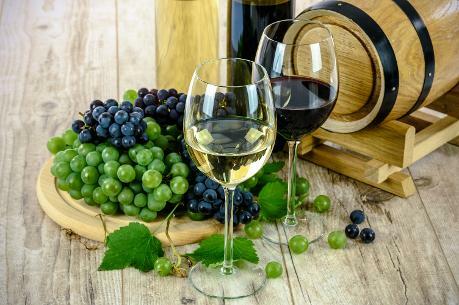 Fermented wine is subject to various infections which turns them acid and gives them a bad odor, they have to be specially treated with preservatives or other processes in order to not grow mold and show other signs of decay. Because of this fact, the “ancients” actually found it much easier to preserve grape juice in an unfermented state than in a fermented state. In fact, by following a careful procedure at harvest time, they could actually store fresh grapes. They would cut the grapes off the vine, leaving a long length of branch still connected to the grapes. Once cut, they would immediately seal the cut end of the branch with pitch. Then they would place the grapes in a container filled with dry chaff and close the container and seal it airtight with clay. Then they would bury this container in a loft filled with dry chaff. By storing the grapes with this method, they could keep the grapes for up to a year, in a state of perfect unspoiled freshness. 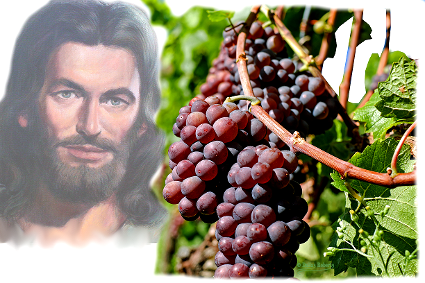 Now as pointed out earlier, the Bible does not use the term “grape juice” to signify the unfermented beverage and “wine” to signify the fermented variety. The Bible simply refers to both as “wine”. the references in the Bible to “wine” and claiming that they are always referring to the alcoholic type. It would almost seem that they are trying to find a way to make the Bible endorse fermented drink. at the wedding in Cana. “And the third day there was a marriage in Cana of Galilee; and the mother of Jesus was there: And both Jesus was called, and his disciples, to the marriage. And when they wanted wine, the mother of Jesus saith unto him, They have no wine. Jesus saith unto her, Woman, what have I to do with thee? mine hour is not yet come. you, do it. And there were set there six waterpots of stone, after the manner of the purifying of the Jews, containing two or three firkins apiece. Jesus saith unto them, Fill the waterpots with water. And they filled them up to the brim. And he saith unto them, Draw out now, and bear unto the governor of the feast. 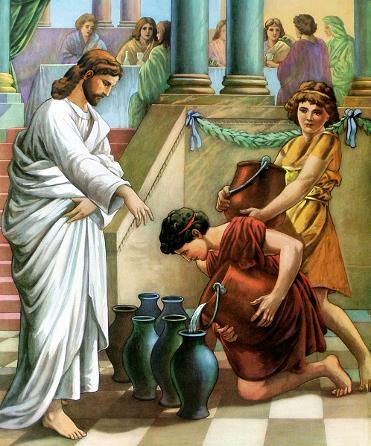 Here in this story, when those in charge of the wedding celebrations realize that they have run out of “wine”, Jesus tells them to fill six pots with water, and as they do so, the power of God changes the water into “wine”. Now the issue with those who claim that this “wine” that Christ made was “alcoholic,” seems to always be focused on trying to condemn the use of alcohol on a regular basis, but excuse and endorse its use when it comes to “communion” in church, or just a little glass of it now and then. Since it is easily proven by science that alcohol in large doses is very detrimental to the human body, they feel like they can’t actually get away with endorsing its use in abundance; yet they don’t want to let go of their habitual use of it at church and parties, so they have to try to figure out a way to endorse it in small quantities. But the principle of that reasoning is seriously flawed. There are actually two concepts that have to be considered. The first concept is from the Bible/Religious aspect and the second concept is from the physiological aspect, the side of science. First we will look at the Religious aspect of this issue. Now I just pulled this reference from one website, but there are many web pages that offer the exact same argument, or ones very similar to it, in order to excuse the use of alcohol in moderate amounts. However, it should be understood that when you resort to Bible dictionaries, Bible commentaries, and various other “works of man” - what you have is just that - the “words of man”. Sometimes these may indeed help explain something, but many times, they are nothing more than guesswork which is biased by the writer’s own opinions and practices, or twisted to mean something they don’t really mean in order to support their preconceived opinions. In other words, whatever comes from man’s words, we should always test by the Bible testimony itself, in order to determine whether that ‘man’ is correct or not! When this website article which I pulled that reference from, refers to the word “wine” used in the story of Jesus turning the water to wine, it tries to make the case that it was “alcoholic wine” that Jesus made.To do so, it resorts to using Vine’s dictionary to prove its point. The Greek word used is indeed “oinos” and it is the word used throughout the New Testament for the general word for “wine” both fermented and unfermented - on this fact, that dictionary is correct. However, nowhere in the New Testament does that word itself “imply” anything. Just referencing that word, does not define whether it is talking about the fermented variety or the pure unfermented variety! Whether it is referring to “fermented” or “unfermented” juice has to be determined from the context in which it is used. By stating that it “implies fermentation” - these “words of man” tend to sway people to their way of thinking - when in reality, the word by itself “implies” nothing! It simply means “wine”. Even if you look at the Greek translation of the Old Testament, you will find that “oinos” is used in both senses - proving that you cannot determine the type of beverage by just looking at the Greek word - you have to go by the context in which it is used. it is very easy to see that Proverbs 3:10 uses the phrase “new wine” to refer to fresh grape juice as coming straight from the grape press. 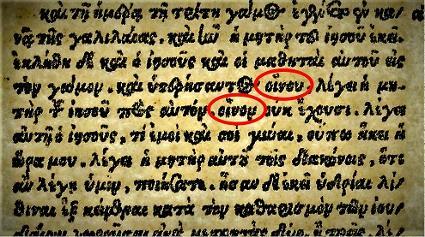 Yet, this very text, in the Greek translation, uses the word “oinos” for “new wine”. at the wedding at Cana. 1. There is abundant and direct Biblical testimony that the use of alcoholic drinks is unwise while unfermented grape juice is considered a blessing. Notice that the Bible is clear - "New wine” is found in the cluster - that is fresh unfermented grape juice! It also specifically says that it is a blessing! And the Bible also makes it clear that the alcoholic wine & alcoholic strong drink have the ability to “Deceive” people. 2. Many persons state that a small amount of alcohol is not harmful, but should we play with baby snakes—since their venom is just as poisonous? Should we drink something we are counseled not to look at? Now if you place a glass of grape juice on the table - does the juice “move itself”? No! But if you place a glass of fermented grape juice on the table, it sits there and releases bubbles - it “moves itself”. These verses plainly state that the kind that “moves itself” will at last “bite like a serpent”. In other words, the final result of using that substance, will be just like the final result of being bitten by a poisonous snake. little baby snake - just a small sip of wine! 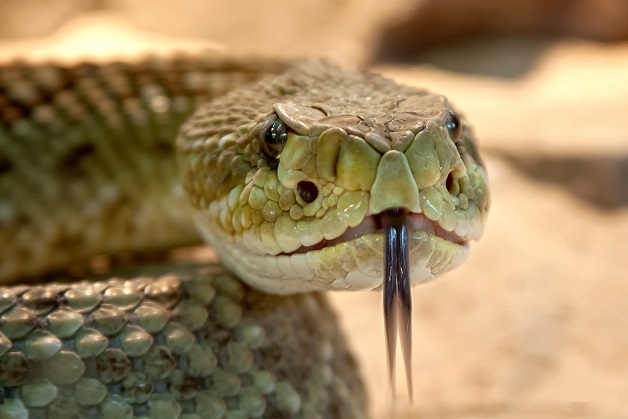 the most dangerous - they are smaller, easier to be hidden, and their bites are more concentrated - but in the end, it is all the same poison. 3. The Biblical record shows that Jesus refused alcohol. Jesus could not have turned the water into alcoholic wine. He is not a bartender. It would be hypocritical to make something that you yourself would not use. Luke 23:36-37 And the soldiers also mocked him, coming to him, and offering him vinegar, And saying, If thou be the king of the Jews, save thyself. Jesus Christ, our Example, showed He was not a hypocrite when he refused the vinegar on the cross. He tasted it and realized what it was, He refused it! 4. All drunkards became so by taking the first little sip. No teetotaler has ever become an alcoholic. There have been people who have become lifelong drunks - simply by taking a single drink of fermented wine. 5. Alcoholic Drinks are often called “spirits.” What spirit is this, the spirit of God or the spirit of devils? In the Bible, alcoholic drinks are contrasted and used opposite of the spirit of God. 6. 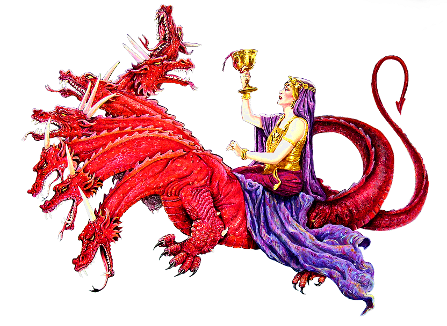 In the Bible, wine is used to represent the blood of Christ. Does the consumption of alcoholic beverages pattern after the characteristics of Christ? Can you get “too much” of following Christ? Spoilage, fermentation, and all other forms of degradation - would all be a spiritual representation of “sin”. Christ never had “sin” - He was “without sin” - therefore, use of a fermented product of any kind to represent His pure body and holy blood is basically a form of blasphemy. It is claiming “in symbolism,” that Christ was sinful. “The wine which Christ provided for the feast, and that which He gave to the disciples as a symbol of His own blood, was the pure juice of the grape. To this the prophet Isaiah refers when he speaks of the new wine "in the cluster," and says, "Destroy it not; for a blessing is in it. "” Isaiah 65:8. 7. Alcohol causes lack of discernment of sin, so God did NOT allow his leaders in his church to drink it. Which is also why we should not be doing anything that would damage our body temple. 8. No one would argue that there are no drunkards in the world, so obviously alcohol causes many to stumble and fall and ultimately be lost according to these verses. Is it then Christian to advocate something (especially for church use) that may cause someone to ultimately be lost? 9. In the Bible, those who drink alcohol and encourage others to drink alcohol are condemned as evil and hypocritical. 10. It is the harlot and Babylon that are prophetically pictured in the Bible dealing out alcoholic beverages which cause fornication, not God’s true church. 11. God’s Spirit resided abundantly with those who refused wine even at times when it could have been considered “rude” to do so. As you can see, when we use the Bible to interpret itself, instead of just assuming whatever answer we want to make, then the Bible makes it clear by the context - exactly what is being talked about. The Bible condemns the use of the spoiled, fermented, alcoholic wine, but it endorses the use of the fresh, unspoiled, unfermented variety, as being good for the body and filled with blessing. “Chrysostom, born a.d. 344, says: ‘Now, indeed, making plain that it is he who changes into wine the water in the vines and the rain drawn up by the roots. 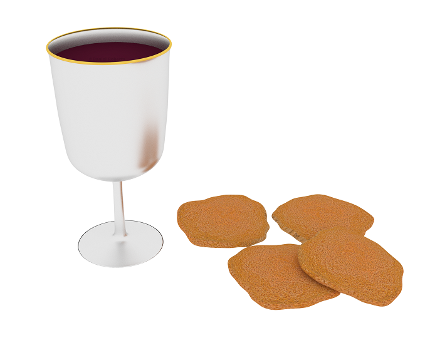 He produced instantly at the wedding-feast that which is formed in the plant during a long course of time.’"
But from past experience, I know that there are still some skeptics out there, that are still trying to find a way for the Bible to endorse the moderate use of fermented and alcoholic drink. I once read a quote that perfectly fits that situation. So now the second concept to examine is from the physiological aspect, the side of science. In other words, how the body reacts to it, or what does grape juice or alcohol do to the human body “temple”! 1 Corinthians 6:19, 20 What? know ye not that your body is the temple of the Holy Ghost which is in you, which ye have of God, and ye are not your own? For ye are bought with a price: therefore glorify God in your body, and in your spirit, which are God's. In other words, “we are what we eat” - the body builds itself or breaks down itself, all depending on what is taken into the body or what the body is exposed to. So the question then is, “When a person consumes some alcohol, does it go into the body and get utilized by the body to build cells, boost immune function, increase the positive effects on the body, and other beneficial things - or does the body consider it a poison to be dealt with like any other dangerous poison? the liver, the brain, the pancreas, and the stomach. the others also do some. the body? If it is so beneficial, why does the body feel endangered by it? When a person consumes alcohol, about 20% of the alcohol is absorbed by the stomach. 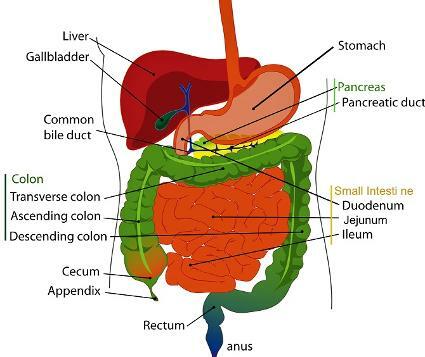 The remaining 80% continues on into the small intestine and gets absorbed there. The alcohol’s rate of absorption (how fast it absorbs into the body) depends on a couple of factors. One factor is the concentration of the alcohol - in other words, a higher concentration of alcohol in a beverage will make the person’s blood alcohol level increase much faster. The other factor is whether there is anything in the stomach (such as food) which will slow down the movement of the alcohol and therefore slow down the absorption factor. 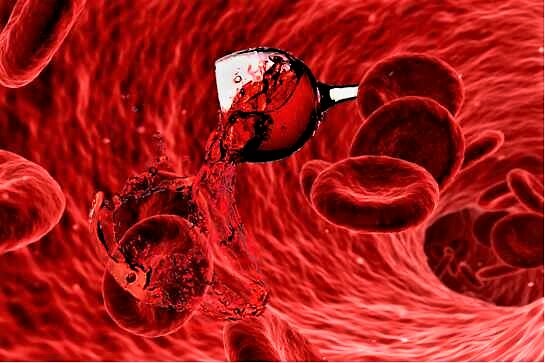 After the alcohol has been absorbed, it moves into the bloodstream and this enables it to get transported throughout the body. The amount of alcohol in the blood increases when the person is taking in alcohol faster than the body can process it. This is where the term “blood alcohol level” comes from. At the same time that it is being absorbed and circulated through the body, the body is also trying to metabolize and remove the alcohol from the system. When alcohol, in even the smallest amount, reaches the stomach, it increases the production of acid in the stomach beyond normal levels, and at the same time also causes irritation and inflammation in the stomach lining. Over time, this can result in stomach ulcers and bleeding. In the short term results, it increases the risk of gut permeability. Gut permeability is when toxins leak from the digestive system into the bloodstream and wreak havoc on the body. All of this eventually leads to disease and cancer. a known carcinogen (In other words, it causes cancer). Acetaldehyde damages liver cells and is capable of causing permanent scarring. an inflamed and diseased state of the liver known as alcoholic hepatitis. This condition then can lead to cirrhosis of the liver where it is so damaged it can no longer repair itself. Cirrhosis then gives way to liver failure and liver cancer. Acetaldehyde is also a diuretic and it is very efficient at dehydrating the body while it is in the bloodstream. It was once thought by scientists that the acetaldehyde in the bloodstream would not pass the blood-brain barrier - yet there was always effects from acetaldehyde in the brain - which is why alcohol always produces brain effects (temporary happy moods, hallucinations, impaired cognitive function, etc.). They are now beginning to discover, that even though the majority of the acetaldehyde in the bloodstream, does not pass the blood-brain barrier, it’s presence does cause the hormones in the brain to produce their own acetaldehyde - which explains how drinking the alcohol can damage the brain. Couple those findings with other science studies that show that wireless radiation from cell phones, WIFI, and other numerous sources actually opens the blood-brain barrier to allow poisons and toxins from the bloodstream to cross - and we see the makings of a very dangerous situation - where not only is the toxic acetaldehyde from the body able to cross into the brain, but the brain will then begin producing its own toxic acetaldehyde. In other words, alcohol alters your neurotransmitters. When alcohol is consumed, it releases two neurotransmitters that occur naturally in the brain. These neurotransmitters are gaba aminobutryric acid (GABA) and dopamine. But the alcohol releases these neurotransmitters in excess of what the brain usually uses. The GABA neurotransmitter calms you down and gives you a relaxed feeling. 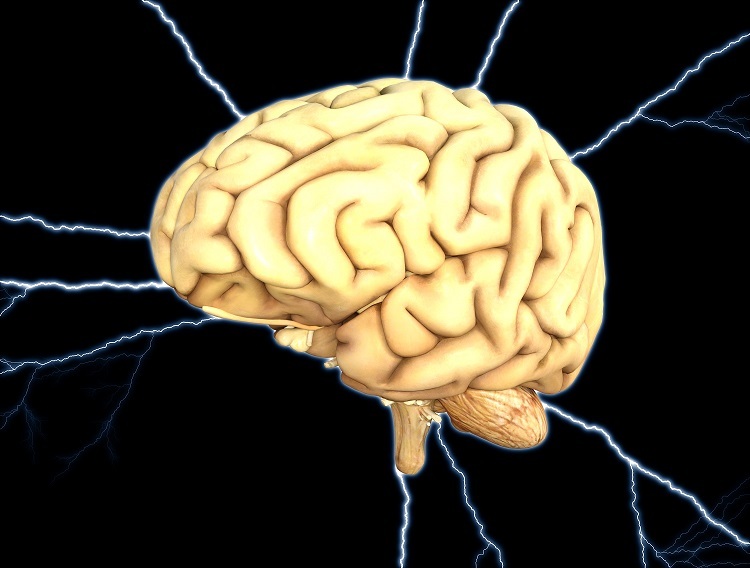 The dopamine neurotransmitter stimulates the feeling of pleasure. This is why people get addicted to that “good feeling” they experience with alcohol. But, as pointed out, alcohol causes too much of these neurotransmitters to be released and this leads to a host of health problems including night terrors, hallucinations, shortness of breath, high blood pressure and an increase in both aggression and depression. The effects of the alcohol gradually lead to temporary amnesia and over the long term use of alcohol, will result in permanent brain damage and the development of Wernicke-Korsakoff Syndrome, a condition that impairs memory, vision and speech. In much the same way that alcohol confuses the brain by forcing it into releasing neurotransmitters and endorphins that it doesn’t need to, alcohol tricks the pancreas as well. It makes it secret enzymes into itself instead of into the bloodstream. When this happens, the accumulation of excess enzymes results in inflammation of the pancreas. 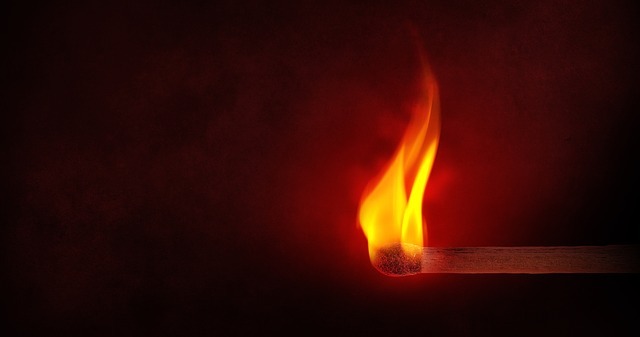 Over time, this inflammation increases the risk of cancer and reduces the organ’s ability to produce insulin which then results in the development of diabetes. It doesn’t matter how much alcohol a person consumes - the human body can only metabolize a certain amount of alcohol every hour. How much it can deal with in a given period of time is dependent upon several factors, among which is the size of the liver and the body’s mass. It has also been proven that different people have variations in the same gene and therefore, they carry different variations of the alcohol dehydrogenase and aldehyde dehydrogenase enzymes - and these enzyme variants work more or less efficiently than others. In other words, some people’s bodies can break down alcohol faster than other people. If the person’s body has a variation of the ADH enzyme that works rapidly and a variation of ALDH that works slowly - then when they consume alcohol, it is quickly broken down into acetaldehyde, but then that toxic substance circulates through the body for a long time, waiting for the ALDH to take over and finish the breaking down process. This creates high levels of toxic acetaldehyde in the body which creates effects such as nausea, flushing in the face, and/or a rapid heart beat. This unpleasant experience of course, tends to make people who carry that variation of the gene to not consume alcohol very often. On the other hand, a person who carries the variation of gene that breaks down the alcohol to acetaldehyde slowly and the acetaldehyde to acetate very quickly, will not experience all those unpleasant things by drinking alcohol, and this in turn makes them drink more often and in larger quantities. But no matter which gene the person has, the acetaldehyde is still doing the same damage inside their body - it is just slower with some and faster with others. In other words, from a physiological perspective, no matter whether you are drinking a single small glass of alcohol, or several gallons of alcohol - the toxic effects on the human body are identical. The only difference is that with larger amounts, the damage builds up faster. Sort of like the difference between wrecking your car in a head on collision which totals it rapidly, or driving for years on heavily salted roads, which eats up the metal slowly and over time, totals the car. The end result is the same! Here are several reasons from a “health” perspective, why drinking only small amounts of alcohol is not wise. The very nature of alcohol defiles/destroys our bodies the temple of God. 1 Corinthians 3:16,17 “Know ye not that ye are the temple of God, and that the Spirit of God dwelleth in you? Even limited alcohol consumption is known to cause birth defects. The very nature of alcohol eliminates the idea of temperance, since large portions of those who drink a little cannot stop. “40% of teens who began drinking at 13 years of age or younger developed an alcohol addiction later in life. Alcohol destroys brain cells and blunts the ability of the frontal lobe of the brain to function correctly. The World Health Organization (WHO) even tells us that drinking alcohol, even in small amounts, is not a good idea. Here are some of their other statements on alcohol consumption. That is just a tiny little bit of the science evidence of the dangers of alcohol. Now a lot of those who promote alcohol for communion and in small doses, like to trumpet the claims as mentioned above, that there are some health benefits gained from drinking red wine. that are present in red wine. are actually found in the fresh grape juice, long before it was fermented into alcohol. This has been proven by studies where alcoholic wine and grape juice have been tested, with the same results having been achieved. Since the results are the same for the unfermented grape juice that doesn’t have alcohol in it as they are for the alcoholic wine - that proves that the beneficial components are in the grape juice itself, not in the alcohol. a person can get the EXACT same health benefits from drinking fresh grape juice and they won’t have the negative effects of the alcohol! So exactly what does fresh, unfermented, grape juice do for the body? White grape juice has been shown to have some health benefits as well, but the dark grape juice especially has the most nutrients. Dark grape juice is an excellent source of copper, iron and manganese, and is therefore very beneficial in the formation and strengthening of bones, as well as providing good health for our digestive system and colon. 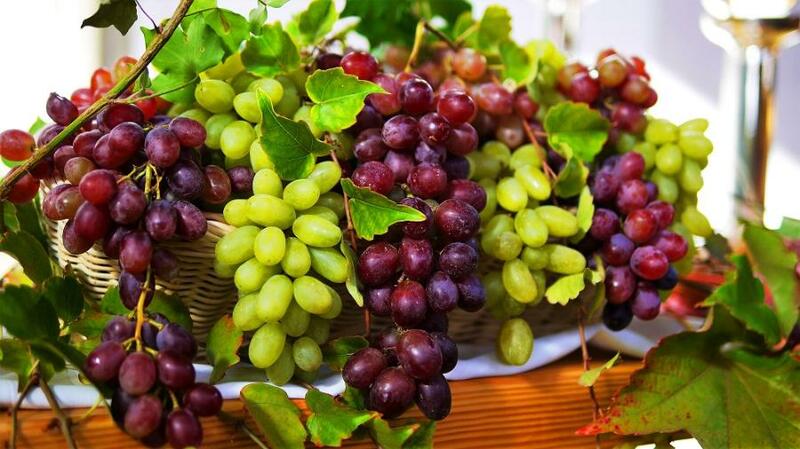 Grape juice also has some natural laxative properties which helps with regular bowel movements. It is also a good source of vitamin B-6, vitamin C and thiamin, as well as the mineral potassium. low-density lipoproteins (LDL) cholesterol (bad cholesterol)0 which is the cholesterol that leads to the buildup of plaque in artery walls which then leads to atherosclerosis. Besides dark grape juice being effective at lowering bad cholesterol, it has also been proven to lower the risk for heart disease, because dark grape juice is “alkalinizing to the blood”1 and an excellent blood builder. It also stimulates the production of sodium oxide which ensures that our blood vessels stay flexible. Dark grape juice is also a natural blood thinner. It decreases the clumping of platelets2 that form clots in arteries (that lead to heart attacks) thereby lowering your risk of heart disease. It also cleans out the arteries and helps the blood have better circulation throughout the body. I have even heard stories about some people using grape juice to replace blood-thinning medication. The anti-oxidants and the anti-bacterial and anti-viral properties of grape juice boosts the immune system. to stay young and healthy and slowing down the aging process. puts your immune system on red alert, thereby increasing the body’s immunity levels. damage cells and cause disease. improvement in brain cognition, its list learning and recall abilities, and in spatial memory. 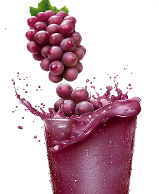 These are just some of the many benefits obtained by drinking pure, unfermented, grape juice. So we have now looked at the physiological aspects of the dangers of alcoholic wine as opposed to the beneficial aspects of pure unfermented grape juice. We have also looked at the Bible’s use of the word “wine” and seen how the Bible endorses the pure unfermented juice, but condemns the fermented alcoholic type. To me, the Bible is very clear - God does not endorse alcoholic beverages in any amount or in any form.